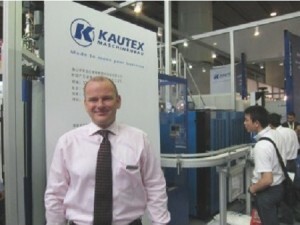 Kuatex Maschinenbau introduced its KCC20S extrusion line for packaging containers ranging from 250ml to 10L. At CHINAPLAS 2013, on display was an application for a 4L jerrycan with handle which is mainly used for agrochemicals. For this purpose, the single-station machine is equipped with a four-layer head for the co-extrusion of barrier, adhesive and two support layers to create a multi-layer structure in the resulting canister. In the co-extrusion process, an adhesive layer is used to bond the barrier layer to a regrind layer made of recycled material, which together with the outer layer, ensures the stability of the jerrycan. The outer layer usually consists of HDPE or another low-cost plastic and can also be colored with master batches if desired. Increasing the production output will not pose any problems, either. Depending on the dimensions of the article, the KCC20S machine can be equipped with multi-cavity molds. The company’s new facility in Shunde, Guangdong was opened in March to satisfy the rising demand for multi-layer and multi-cavity machines in China. Managing partner Andreas Lichtenauer pointed out that the packaging and automotive industry are driving forward the plastics industry because Chinese manufacturers are looking for higher quality, lightweight and energy saving.